Frome’s ‘Showstoppers’ are ready to sparkle! FMTC Showstoppers preparing for their performance. 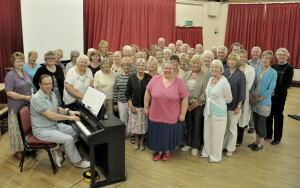 THE Frome Musical Theatre Company concert group ‘Showstoppers’ are getting close to the climax of their rehearsals. Gill Barnes, on behalf of ‘Showstoppers’ said, “This year we have a great selection of very listenable songs for our audiences, ranging from ‘Fiddler on the Roof’ to Rodgers & Hammerstein. Also on the programme there are some interesting jazzy songs like ‘In the Mood’, ‘Boogie Woogie Bugle Boy’ and the ‘Best of James Bond’. The group meets every Monday at the Assembly Rooms, and there are approximately 60 in the group. Tickets are £9.00 and ‘Showstoppers’ will be performing for three nights in the assembly rooms (adjacent to the Memorial Theatre) on Thursday 31st October, Friday 1st and Saturday 2nd November, starting at 7.30pm. The box office is open Monday – Saturday 9.30am to 1.00pm – tel: 01373 462795 or on-line www.fromememorialthe atre.org.uk. Don’t delay, book today to avoid disappointment.